After spending a relaxing morning hanging out in our cabin by Grand Lake Stream, getting some work done on the laptop, my son voraciously reading a book (and with his dyslexia, that’s always a blessing), and visiting with Kathy and Kurt at the store, we drove down the road and met Lisa at Peter Dana Point, also known as Indian Township, the other Washington County Passamaquoddy Reservation. Lisa’s father, Allen Sockabasin, was our host for the afternoon. Sitting by the shore of Big Lake, we spent a relaxing time talking while the children explored the woods and waterfront. His stories are full of struggles as well as inspiration – about his growing up on the Reservation, his years as Passamaquoddy Governor, his efforts to preserve Passamaquoddy language, history, and culture, and his dedication to working with today’s youth through his books, his many guest appearances in Maine schools, and his work with Native youth. Although I would have enjoyed sitting and talking with Allen all afternoon, after a while he took us for a boat ride. For over two hours we skimmed over Big Lake, and except for Peter Dana Point, we encountered no other motorized boats, no houses, and no people - just lake, woods, and bald eagles. Allen pointed out his favorite hunting and fishing grounds. I imagined that over the past 12,000 years many have hunted and fished here and shared the exact same views that we enjoyed today. From a distance across the water, Alan easily pointed out several bald eagles atop trees. Realizing how important these rare birds are to Native American history and culture, I was even more touched by their appearances. In Native American culture, it is an eagle’s wings that flap and make snow, and an eagle’s wings that likewise make wind. The bald eagles looked like they had been peering over life on Big Lake for thousands of years. As I left Peter Dana Point, I made one last stop - the cemetery. On one hand, it is a place of beauty, blanketing the slopes overlooking the peaceful lake. On the other hand, there is striking evidence of struggles and tragedy. The graves were primarily of young Native Americans – people in their 20s, 30s, and 40s. Only occasionally was a grave for someone in their 60s or older. Clearly, this cemetery told a story of too many people dying too young. 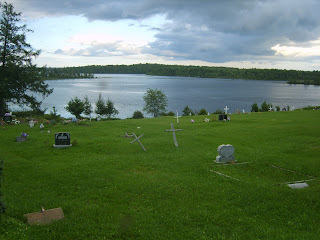 The cemetery gave a grim picture of what we have been told – life expectancy is decreasing in this corner of Maine. As we drove away, I explained this to my children, and they asked, “It’s so beautiful here, why are young people dying?” I told them the answers are complex and perhaps not fully known right now. I told them that poverty, lack of educational opportunities, and isolation all contribute to health risks such as smoking, substance abuse, poor nutrition, and physical inactivity. And, these risks in turn contribute to causes of death such as cancer, heart disease and stroke, diabetes, and suicide. But, the data can only tell us so much. The people of Washington County probably know more about the reasons and more of the solutions than the data alone can tell us. I told them that it is part of our job as state officials to gather and analyze the data, but it is also part of our job to listen to and learn from what those in Washington County have to say.